The last post in this series looked at the temperatures for Maryland and so, moving up along the coast, the next stop is Delaware. 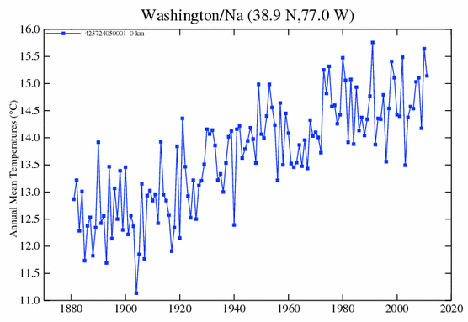 Given the small size of the state, I thought it might also be interesting to compare the results with those for the GISS station in Washington D.C., since the latter would otherwise be left out. They are at about the same latitude, and of somewhat similar elevation, differing only in the size of their populations. Given the built-up nature of the area around Wilmington there could be some debate as to the relative population sizes about the various stations, but for the moment I will accept the values from the citi-data sites that I have used to date. (The question is raised particularly regarding the Newark University Farm, which GISS considers to lie within metropolitan Wilmington). 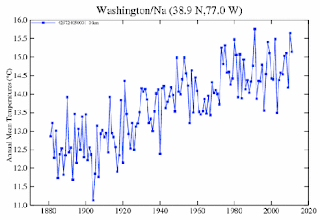 It turns out that Washington is, on average, about 2.76 deg F hotter than the average for Delaware, though the difference has changed, with a steady increase until around 1980, and a fall thereafter. 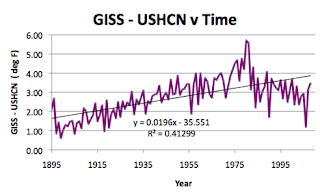 Difference between the temperature reported for the GISS station at Washington DC and the USHCN average homogenized temperature for Delaware. 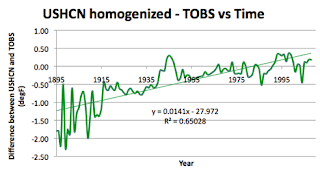 Average temperature for the USHCN stations in Delaware after homogenization. 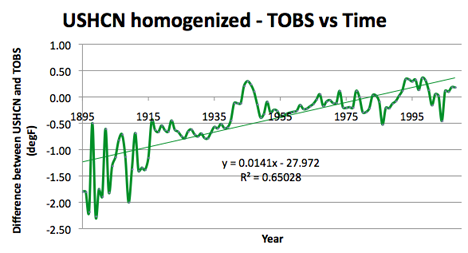 Average temperature for the USHCN stations in Delaware raw data after correction for time of observation (TOBS). 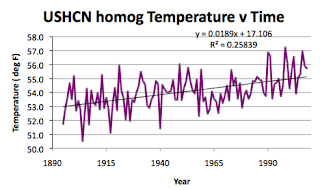 The temperature drop from around 1950 to 1965 is still present, but the overall temperature increase has fallen from 1.9 deg F per century down to 0.5 deg F per century. 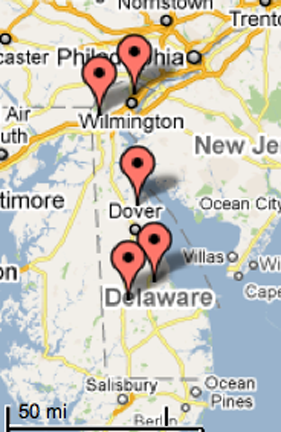 Delaware is the second smallest state (after Rhode Island) and is only 100 miles long, while 30 miles wide. 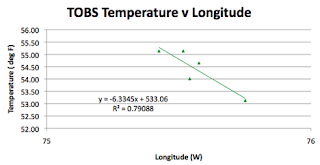 It stretches roughly from 75 deg W to 75.75 deg W, and from 38.5 deg N, to 39.8 deg N. The mean latitude is sensibly 39 deg N, the average of the USHCN stations is 39.3 deg N (D.C. is at 38.85). 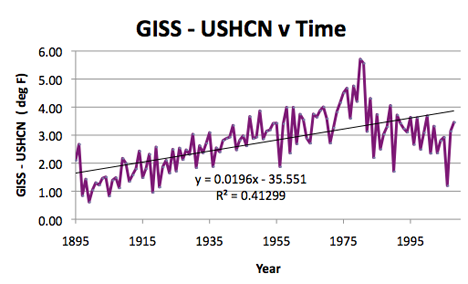 The state elevation runs from sea-level to 137 m with the mean at 18.3 m. The average of the USHCN stations is at 28.6 m.
The small number of stations makes the correlation coefficients of little real value, but they are included for consistency. It will be interesting to see how these numbers fit in when I compile the overall statistics. 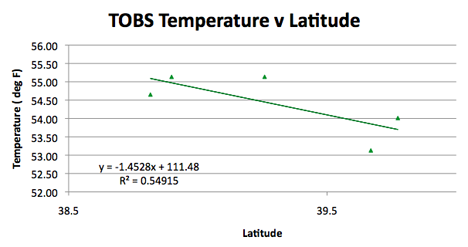 Change in average station temperature in Delaware as a function of latitude. 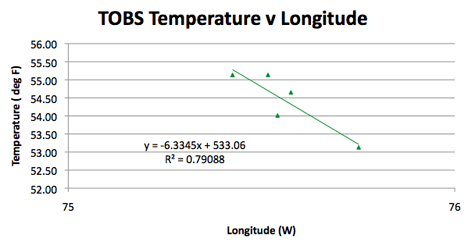 Change in average station temperature in Delaware as a function of longitude. 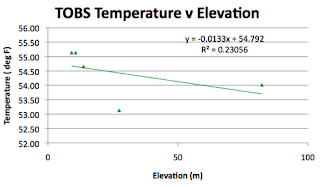 Because of the relatively small change in elevation for the different stations, the correlation with elevation is not as evident here. 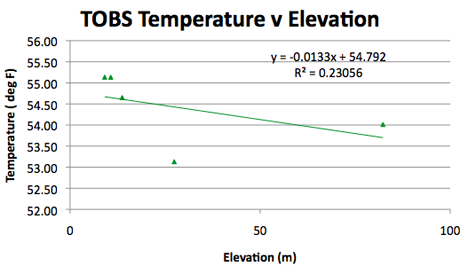 Change in average station temperature in Delaware as a function of elevation. 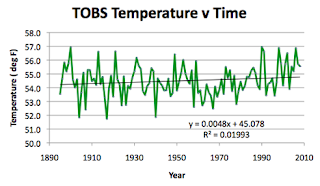 When I looked at the TOBS data available there is insufficient recent information to provide a realistic plot of temperature against local population unfortunately, but I’ll include the plot for consistency. 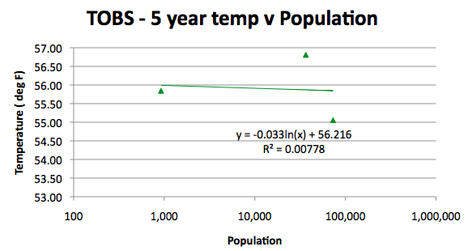 Change in average station temperature in Delaware as a function of population around the station. 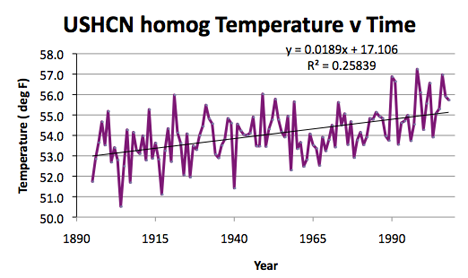 It is clear in Delaware, as elsewhere, that the homogenization of temperature data, has led to an increase in reported temperatures with time. 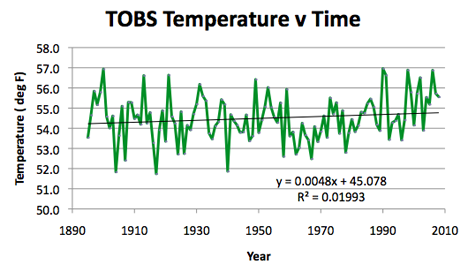 Increase in temperature from the TOBS data to the reported homogenized temperatures for the stations in Delaware.